The Dysaphis devecta species group includes three species: Dysaphis devecta, Dysaphis anthrisci and Dysaphis chaerophylli. 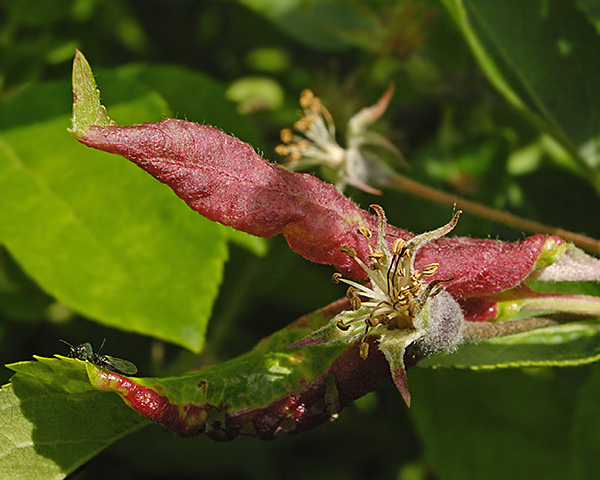 All members of the Dysaphis devecta group roll the edges of apple leaves and turn them red to produce a characteristic gall on apple (see first picture below). Late spring colonies of Dysaphis devecta sensu stricto (which do not host alternate) include many apterae or alatiform apterae with sclerotized thorax. Apterae are bluish-grey and wax-powdered (see second picture below). Immature future alatae are dark green to reddish. Late spring colonies of other members of the group (Dysaphis anthrisci & Dysaphis chaerophylli, both of which host alternate) include many immatures and adult alates . 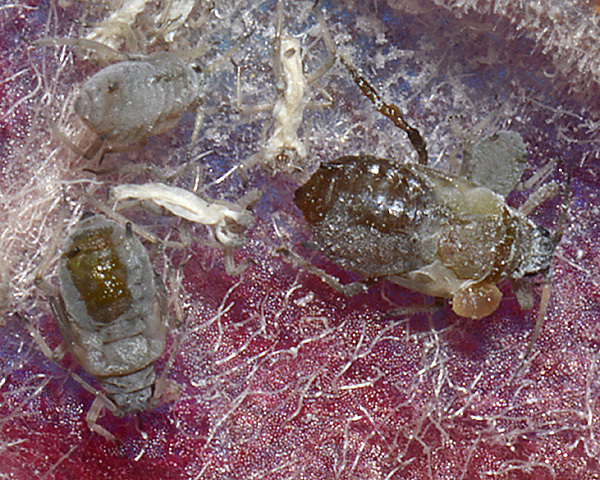 The clarified slide mount below are of adult wingless female, adult alatiform female and alate female Dysaphis devecta. There is (not surprisingly) much less written about members of the Dysaphis devecta species group than there is about Dysaphis plantaginea. This is partly because they cause less damage to apple trees, and also (we suspect) because, at least on apple, it can be difficult to tell if one is dealing with Dysaphis devecta or one of its sibling species. Forrest & Dixon (1970) described the induction of leaf-roll galls by the apple aphids Dysaphis devecta and Dysaphis plantaginea. Dysaphis devecta causes the leaves of its host plant to roll laterally (see picture below). Dysaphis plantaginea, on the other hand, causes them to roll longitudinally (in other words from the leaf apex to the base, see picture below). 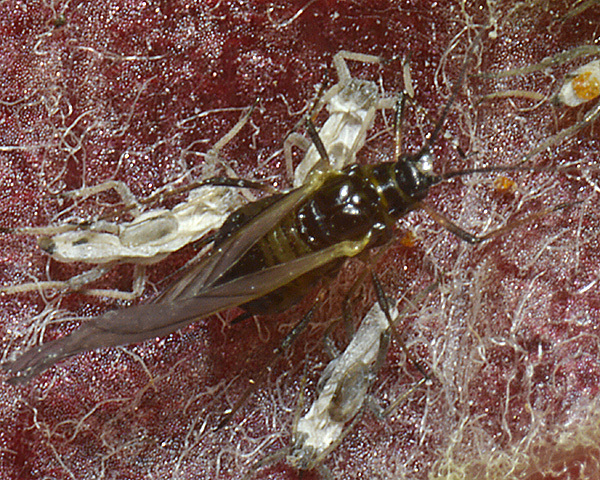 Both species of aphid are phloem feeders, but Dysaphis devecta prefers to feed on the smaller veins in the lamina, whereas Dysaphis plantaginea chooses the midrib. If one confines groups of Dysaphis devecta or Dysaphis plantaginea to the stem of an apple seedling, young leaves several centimetres away are induced to develop leaf rolls characteristic of each species. The characteristic abnormalities in leaves attacked by Dysaphis devecta and Dysaphis plantaginea appear to be caused by specific substances in the saliva of each aphid. Forrest (1970) investigated the effect of maternal and larval experience on morph determination in Dysaphis devecta. 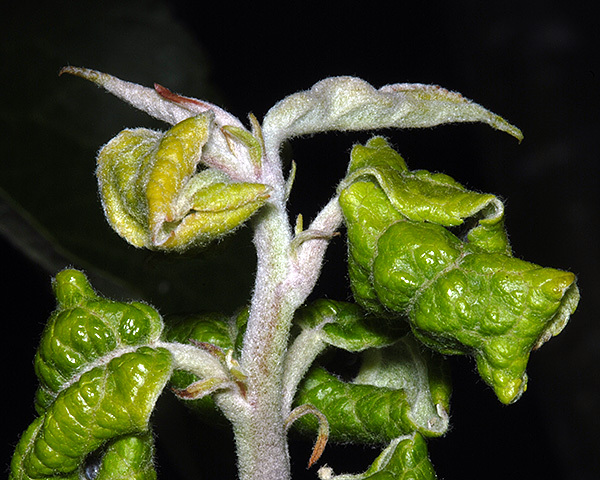 When larvae from mothers reared singly on young apple plants are reared in isolation on older plants deprived of nitrogen they may become alatiform or alate. Larvae are determined irreversibly as normal apterae, alatiforms, and alates during the first 4 days of their lives. This process occurs cumulatively over this period. If mothers are reared under unfavourable conditions, this can affect the way in which larvae react to morph determining stimuli postnatally. Forrest (1974) demonstrated that crowding also has an effect on morph determination of Dysaphis devecta. 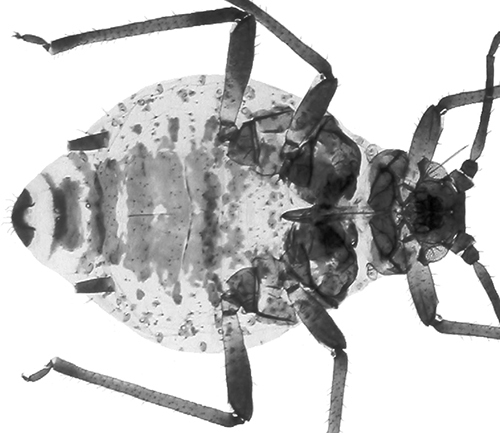 Llewellyn & Hargreaves (1986) determined larval growth, reproduction and energetics of Dysaphis devecta and Aphis pomi for apterae living and feeding in the newly formed and 2 or 3 week old pseudogall. The assimilation/consumed energy ratio, an indicator of food quality, was 57% for Aphis pomi in young galls and 22% on other feeding sites. Apterous Dysaphis devecta had an assimilation/consumed energy ratio of 76% compared to a mean of 31% for alatiforms within and outside galls. The highly specialized gall inhabiting Dysaphis devecta apterae derive greater physiological benefit from gall feeding than the generalist Aphis pomi which can survive and reproduce within or outside its gall. We have only found the rosy leaf curling apple aphid on a few occasions. One time we found predatory cecidomyiid larvae within the gall, and one nymph with a mite attached (see first and second image above). Bayram (2009) surveyed the coccinellid species feeding on Dysaphis devecta in Ankara, Turkey in 2002. 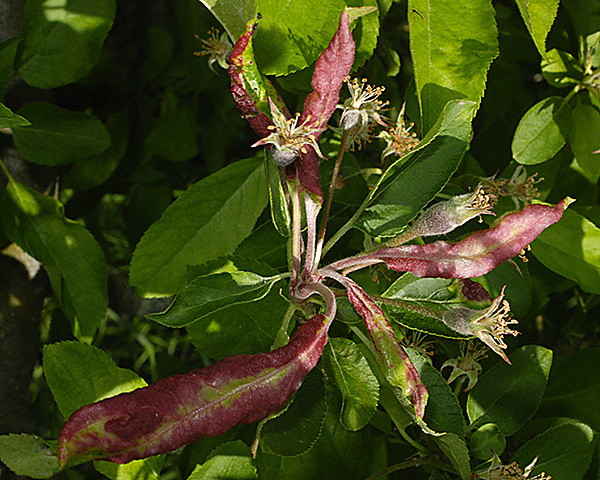 Dysaphis devecta is considered an important pest of apple in Ankara. Six species were present: Adalia bipunctata was the commonest but Adalia fasciatopunctata, Coccinella septempunctata, Exochomus quadripustulatus, Oenopia conglobata and Scymnus subvillosus were also found. Dysaphis devecta has been recorded on 6 species of the Malus genus: Malus baccata (Siberian crab-apple), Malus domestica (apple, European crab-apple, paradise apple), Malus floribunda, Malus orientalis, Malus prunifolia and Malus sieversii (central Asian wild apple). Blackman & Eastop list more than 49 species of aphid which feed on apples (Malus domestica, which includes Malus pumila & Malus sylvestris) worldwide. 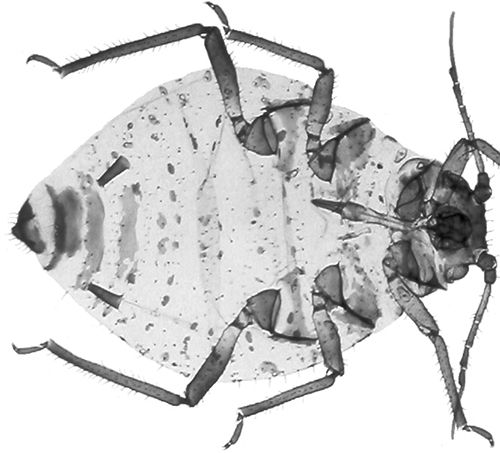 Of those aphid species, Baker (2015) lists 21 as occurring in Britain: Aphis aurantii, Aphis craccivora, Aphis fabae, Aphis gossypii, Aphis pomi, Aphis spiraecola, Aulacorthum solani, Dysaphis anthrisci, Dysaphis brancoi rogersoni, Dysaphis chaerophylli, Dysaphis devecta, Dysaphis plantaginea, Dysaphis radicola group, Eriosoma lanigerum, Macrosiphum euphorbiae, Macrosiphum rosae, Myzus persicae, Nearctaphis bakeri, Ovatus crataegarius, Ovatus insitus, and Rhopalosiphum oxyacanthae. 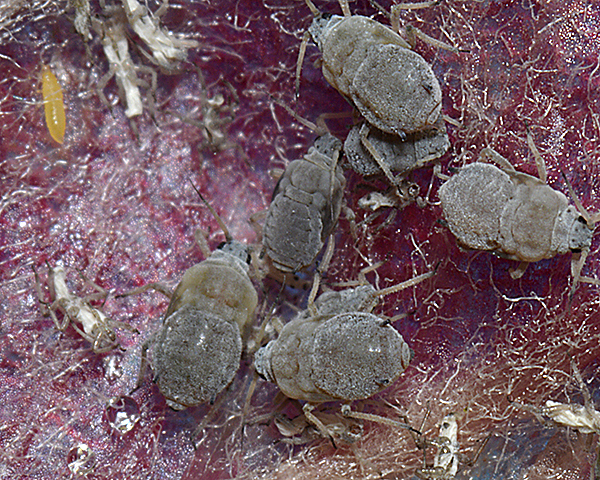 Unlike Dysaphis plantaginea, Dysaphis devecta is only a minor pest of apple, and rarely requires control measures. It tends to be very localized in occurrence, often appearing in the same site year after year. Alston & Briggs (1977) investigated the genetic basis of resistance in apple to Dysaphis devecta. In an experimental orchard Trandafirescu et al. (2004) found that populations of both Dysaphis devecta and Dysaphis plantaginea were reduced by natural enemies to a point where no chemical control was needed. Marko et al. 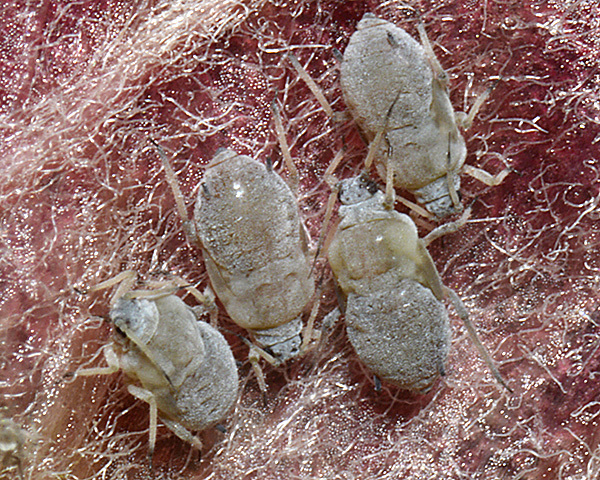 (2006) found that a kaolin-based particle film formulation had no effect on the number of colonies of rosy leaf-curling apple aphids. We especially thank Plumpton College at Stanmer Park for their kind assistance, and permission to sample. We have made provisional identifications from high resolution photos of living specimens, along with host plant identity. 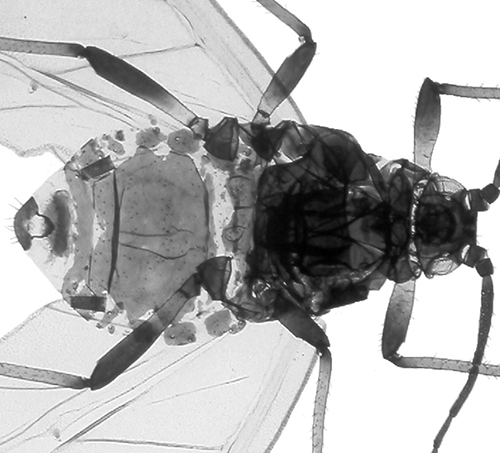 In the great majority of cases, identifications have been confirmed by microscopic examination of preserved specimens. We have used the keys and species accounts of Blackman & Eastop (1994) and Blackman & Eastop (2006) supplemented with Blackman (1974), Stroyan (1977), Stroyan (1984), Blackman & Eastop (1984), Heie (1980-1995), Dixon & Thieme (2007) and Blackman (2010). We fully acknowledge these authors as the source for the (summarized) taxonomic information we have presented. Any errors in identification or information are ours alone, and we would be very grateful for any corrections. For assistance on the terms used for aphid morphology we suggest the figure provided by Blackman & Eastop (2006).